Indonesia, March 2016 - Archipelago International, Indonesia's fastest growing hotel management chain, has received the Top Producing Hotel Chain Award 2015 by Hotelbeds, a global distributor of accommodation and ancillary products to the world’s travel trade. Hotelbeds' business expansion to Indonesia and cooperation with Archipelago International following a partnership deal in 2014, has allowed the two companies to work closely together and achieve the biggest increase in business in Hotelbeds' history. In 2015, the cooperation brought a 60% increment - the highest performance results compared to all other hotel management chains in Indonesia and pulling in business from other markets beyond Indonesia. 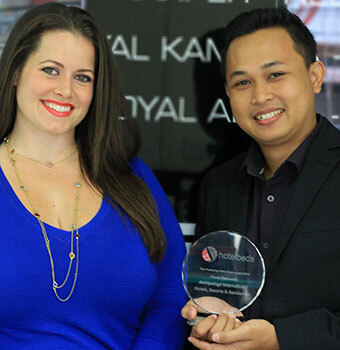 The accolade follows 10 other recent awards granted to the Corporate Sales & Marketing team, strengthening Archipelago International’s strategy to centrally manage various sales and marketing efforts for their hotels. The team has successfully demonstrated their ability to manage Hotelbeds’ offline and online booking systems, selling accommodation worldwide, conveniently. “It was an absolute pleasure working with the Hotelbeds team and I'm happy to see all our hard work, late nights and strategic sessions have paid off. It continues to be our goal to bring our hotels the most support in our management style, with education, guidance and especially revenue.” says Tenaiya Brookfield, VP of Sales & Marketing Archipelago International.